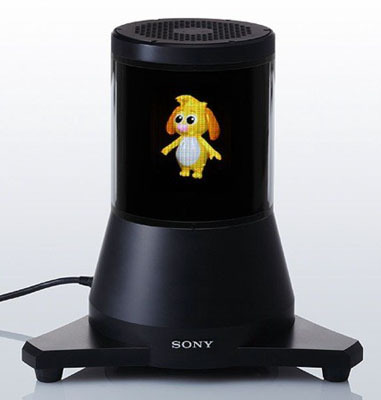 With so many firms jumping on the 3D TV bandwagon, Sony has obviously felt compelled to push the envelope further still. So it has developed a 360° 3D display. Confused by the term? You shouldn’t be, because the prototype display is essentially a tube-shaped unit able to show a 3D image to anyone looking at it from – presumably - a face-on angle. It isn’t yet clear if all viewers all see the side of the 3D image, irrespective of their viewing angle, or if you see a different side of the image depending on how you’re facing it. The display also works without glasses, Sony claimed. In its current form, the 13cm wide by 27cm high unit can display images in 24-bit colour. The new electronic reader from Barnes & Noble Inc, expected to launch on Tuesday, features color, a touchscreen display and the same price tag as Amazon.com Inc’s Kindle, the Wall Street Journal reported on Monday. The device, which the newspaper said was called “Nook,” will compete with the Kindle and Sony Corp’s Sony Reader among other electronic readers that allow users to read digital content on a tablet-sized device. The Journal said the details came from a print advertisement slated for the New York Times’ October 25 edition. Barnes & Noble and the New York Times did not immediately respond to a request for comment. A host of competitors are trying to grab market share from Amazon, which is believed to dominate the fast-growing yet still small industry. The past month has been characterized by a flurry of activity as booksellers, manufacturers, publishers and wireless operators all hope to gain a toehold in advance of the key holiday selling season. In July, Barnes & Noble, the largest brick-and-mortar bookseller in the United States, debuted what it called the world’s largest online digital bookstore with over 700,000 titles, readable on devices like Apple Inc’s iPhone. Analysts say that Barnes & Noble’s advantage could be in its physical stores where users will be able to test out the device, as well as its strong relationship with publishers — an advantage that Amazon also enjoys. With a $259 price tag, the same as the Kindle’s recently lowered price, Barnes & Noble could potentially lure users away from the Kindle, which some critics say is short on design and functionality. A color touchscreen display would be considered a plus by some users, who have grown accustomed to higher functionality on devices such as Apple’s iPhone and iPod Touch.